Creating connections through artistic expression: The pastoral vistas, fields of crops, healthy livestock – all have inspired artists throughout history and allowed them to connect those who live on rural landscapes with urban dwellers. Artist Robert Butler creates that connection through his paintings inspired by his own childhood growing up on a Florida farm. Robert Butler, raised in Florida, has been described as “tutored by nature.” He was born the son of a sharecropper and began his career painting wildlife and scenery around the small farm community of Okeechobee, Florida. This self-taught artist proudly raised his family doing what he loved best – painting. With his wife supporting his efforts, Butler soon rose in notoriety. He was one of the best-known naturalist painters in the country when he died in 2014. In 1999, the Florida Department of Agriculture and Consumer Services commissioned 12 historic artist depictions of Florida’s agricultural heritage, all painted by Butler. With a population of close to 1.2 million in Florida, the American alligator is not only a part of the state’s history and ecosystem, but also a valuable product in terms of alligator meat and high-quality leather that is used in a variety of products throughout the fashion world. Florida alligator farmers take the pressure off of the wild alligator population to meet demand for alligator-skin products, including purses, shoes, furniture, hats, luggage, apparel and more. 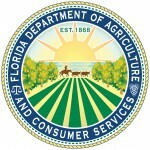 The Florida Department of Agriculture and Consumers Services works with the Florida Alligator Marketing and Education Committee (FAME) to market alligator leather across the world. The industry also includes finished alligator hides. In the past, FAME has partnered with the Savannah College of Art and Design, also known as SCAD, to encourage fashion and design students to use Florida alligator skin as a material in their creations. Each student was given two alligator leather hides to produce a collection of three accessory pieces. 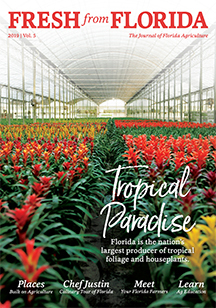 Learn more about alligator leather and how it’s being used at florida-alligator.com.